I never miss a chance to get together with my Napa Valley tasting group. Our shared passion for the great wines of Napa Valley has been the catalyst for a number of fabulous tastings over the years. This dinner at Press was another in a series of unforgettable evenings. On this night we were seated at the large table downstairs just outside the cellar, probably a good thing for the sanity of the rest of the restaurant’s patrons, as the action can get pretty intense once the bottles start coming. Press has one of the most remarkable lists in the United States. There is something for every palate; from the most traditional to the most modern. Sommeliers Scott Brenner and Kelli White have done a fabulous job in assembling a collection of Napa Valley’s crown jewels, all of which were just a few from us. Even though our focus was a bit more on wine rather than food, the menu was beautifully done. 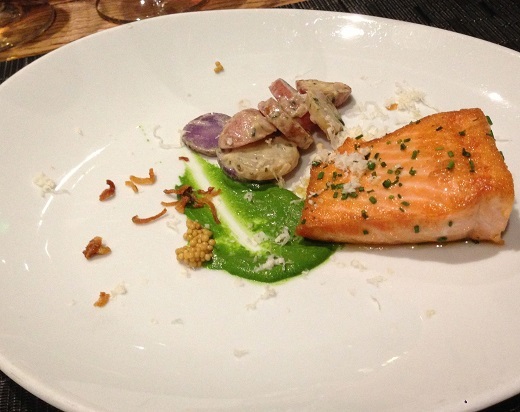 The Wild King Salmon starter was perfectly cooked and delicious. 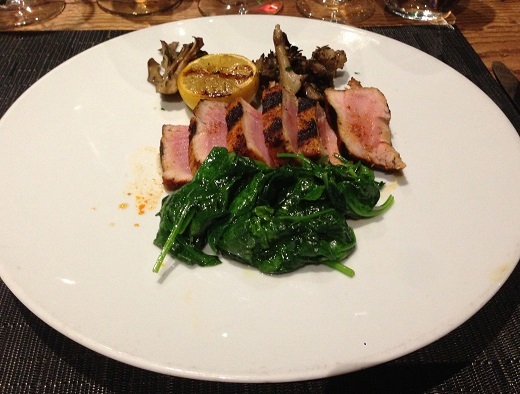 My Ahi Tuna main course was just as tasty. I could not resist seconds of the potato & garlic cake and sautéed spinach, both of which were served family style. 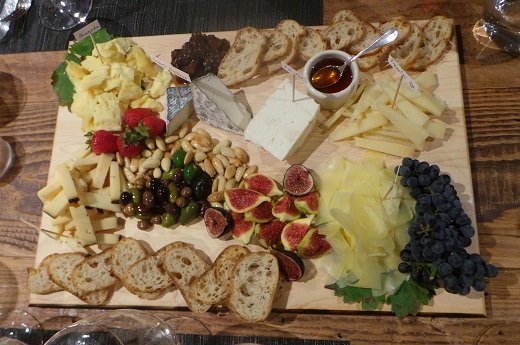 The tour-de-force, though, was the cheese platter, which was simply out of this world. Louis Martini’s 1968 California Mountain Barbera was a revelation for all of us. With its sweet earthy/tobacco scents, lively red fruit and vibrant acidity, the 1968 came across as a blend of Pinot and Barbera. It is of course impossible to know the exact varieties used in wines of this era, but it is quite possible the 1968 was not 100% Barbera. It didn’t really matter though, as the wine was stunning in its beauty and liveliness. What a great start. Tom Dehlinger’s 1997 Pinot Noir was another revelation. Beautifully expressive and generous, it showed fabulous depth and plenty of Russian River character, with lovely tertiary complexity but enough fruit to drink well for a number of years. The 1980 Caymus Cabernet Sauvignon Grace Family Vineyard was the first in a series of monumental wines. Smoke, cedar, leather and sweet spices all flowed from the glass in a rich, structured Cabernet Sauvignon still endowed with tons of class and personality, even after 30+ years. This was a great, great showing. Spring Mountain’s Cabernet Sauvignon Lot H.68.69.LN, with its strange, non-vintage designation, is supposedly a combination of all/partly bulked out 1968/1969 juice from Martha’s Vineyard. Mint, leather, sweet spices and dried cherries were some of the nuances that emerged from this eccentric, quirky Cabernet Sauvignon. The 1973 Cabernet Sauvignon from Spring Mountain was quite pretty, if a touch fragile. Sweet scents of tobacco, licorice, dried fruit and leather informed the soft, fragrant finish in a wine that is at peak. A tannic behemoth, the 1978 Cabernet Sauvignon from Carneros Creek Winery impressed for its freshness and vibrancy, but it remains an intense wine that will appeal to readers who appreciate massively structured Cabernets. Some rough edges showed through, but it was impossible not to admire the wine’s pure personality, especially with time in the decanter. Diamond Creek’s 1976 Cabernet Sauvignon Red Rock Terrace was beautifully expressive and layered. The Diamond Creek Cabernets of this era needed so much bottle age, but today they are simply striking. Hints of iron, black fruit, cloves and menthol lingered on the powerful close. Two wines from Randy Dunn followed. Exotic, floral and spiced, the 1985 Cabernet Sauvignon Howell Mountain was drop-dead gorgeous. I have frankly had mixed experiences with the 1985, but this was a great bottle, with vibrant, layered fruit and plenty of mid-palate depth – for a Dunn Cabernet. 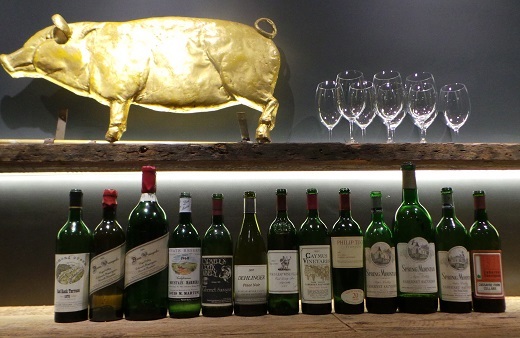 Still explosive, the 1985 Cabernet Sauvignon is another wine with plenty of life ahead. The 1984 Cabernet Sauvignon Howell Mountain (magnum) took things into the stratosphere. 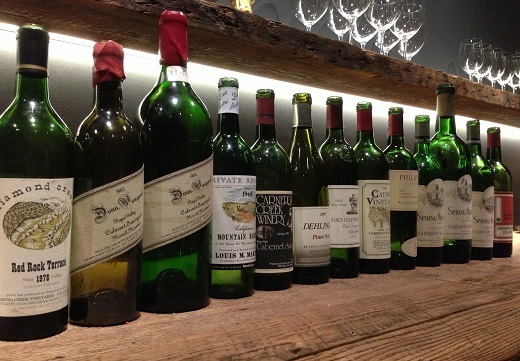 A superb, thrilling wine, the 1984 captured the essence of what makes these wines so compelling in great vintages. The classic, nearly impenetrable Dunn tannins were present, but the 1984 has more than enough fruit and pure depth to balance things out. Dark plum, cherry, licorice and spice notes all added complexity on the powerful finish. Drinking this out of magnum was a real treat. Philip Togni’s 1985 Cabernet Sauvignon was off the charts. Over the decades Togni has made some of the most iconic Napa Valley wines, and the 1985 is right up there with his very best. Still fresh and vibrant to the core, the 1985 showed massive depth, concentration and pure power. An exotic melange of mocha, sweet tobacco, plum and espresso added nuance, but the 1985 remains young, with several decades of exceptional drinking ahead. The last wine of the night, Togni’s 1985 Cabernet Sauvignon was a fitting conclusion to this fabulous look back at some of Napa Valley’s iconic producers and wines.